Man catches fish online using clickbait! 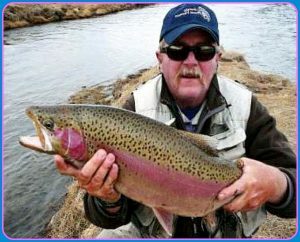 Baiting Hollow, NY – As predicted, a man has actually caught a real live rainbow trout on the internet using only clickbait for a lure. Mr. Clarity “Clare” Bostick of 4104 Melm Street in Baiting Hollow, New York now holds the record for the largest (and only) fish to be caught online using only clickbait. “Let me be perfectly Clare, I was surprised as hell when I reeled in this beauty off the internet, using only clickbait!” said Clare Bostick of Melm Street. Ironically, Clare’s wife is the first person to officially catch the Zika Virus from an app on her smartphone. Both Clare and Clarissa Bostick of Melm Street attempted to post these unique events on Facebook but due to a new anti-clickbait algorithm, Facebook would not only not accept their posts but went on to delete their entire Facebook accounts. Moral of the story: Do not use clickbait on Facebook or anything that even rhymes with clickbait such as trick plate, pick mate, kick straight, brick weight, and quick hate because these will not only not get published on the Facebook but will also cost you your Facebook membership for life.